While the changes of our lives eb and flo even though we think we are rooted, sometimes we need a protective energy for the space of that changing. This being is one that was channeled to me in all its colors and patterns to create just such a protected space for our changing. Perhaps he needs to be with you at this time in your life to do that work with you. 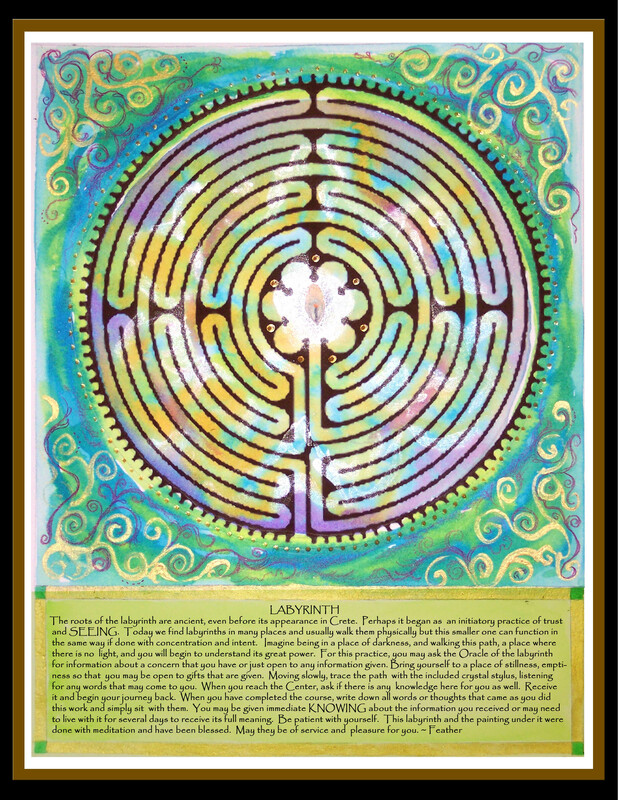 Ancient traditions of the labyrinth are captured in watercolor and colored pencil in this smaller version that can be traced with the included handmade stylus. Rich, gold highlights are added to the finished print making each one slightly different. Basic instructions for its use are added at the bottom of the image so that you may use it as often as you like without leaving the comfort of your abode. 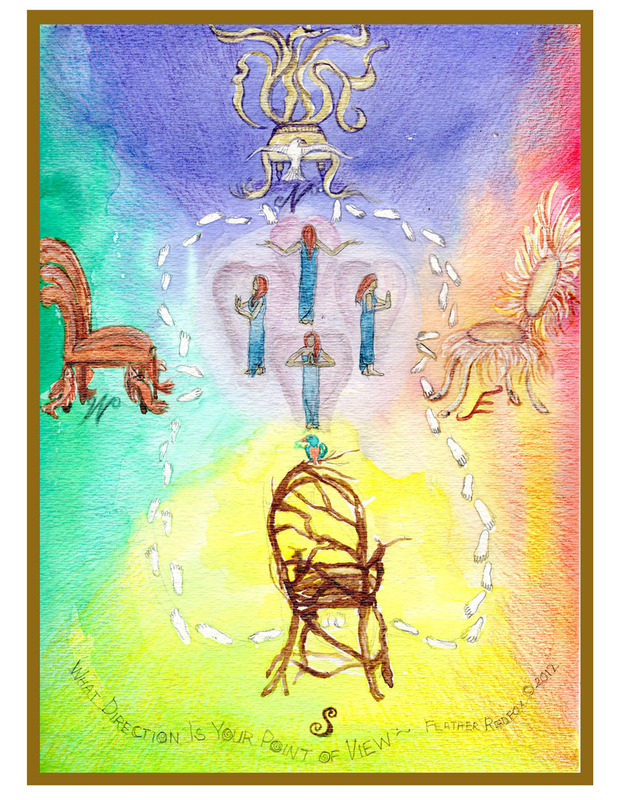 Investigate this timeless way of stilling your mind, asking questions and receiving information from your guidance. 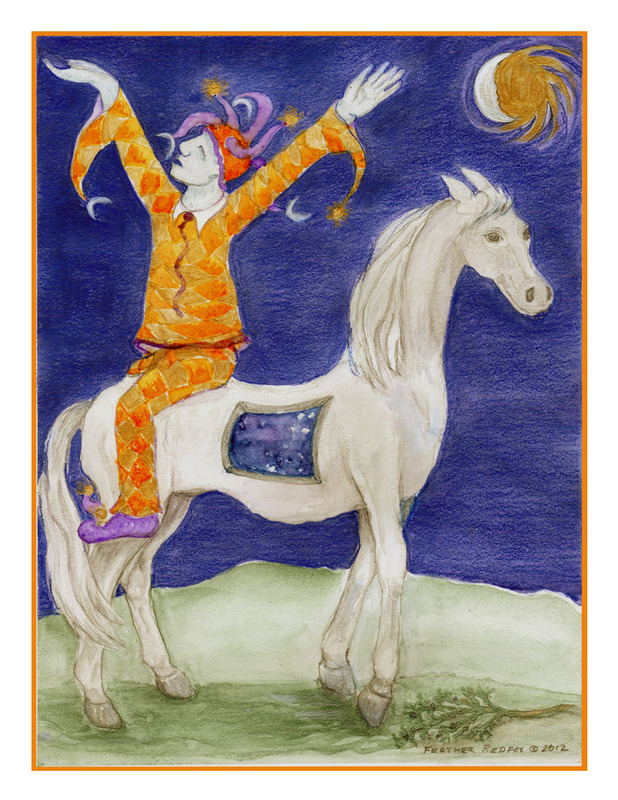 A combination of watercoor and colored pencil create the image of a Jester riding his horse backwards. The horse in this instance is an old wise one for he opens to the knowing of the Universe. Similar images of backwards riders have been used in Native American traditions to express total trust in the Great Spirit, or for our purposes, in your Source Connection. This image came to me in a dream and I share it with you. May it be a gentle reminder that Patience is the Result of Trust and letting go of set outcomes. Blessings be yours as you share this print. 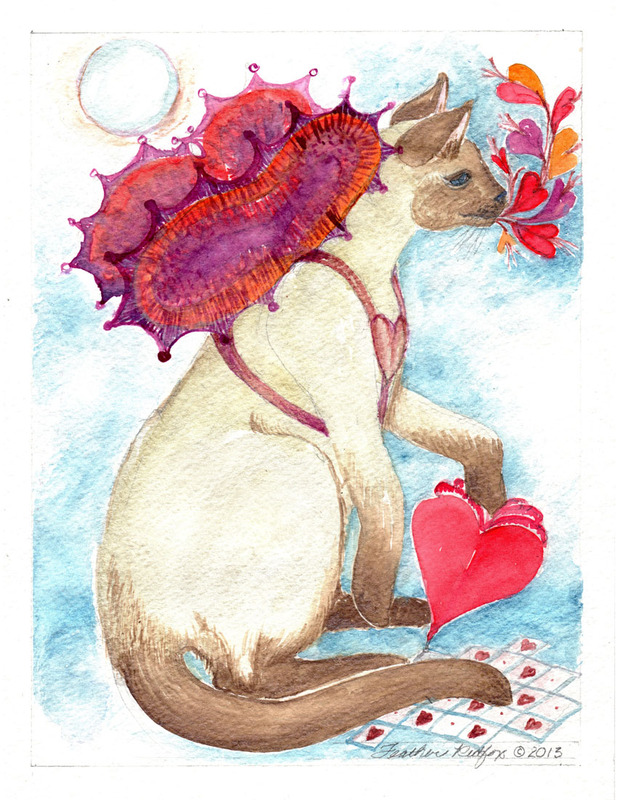 This joyous little watercolor of a Siamese sending out Heart Speak will appeal to all cat lovers and others as well. The heart wings let this little one take flights of fancy and perhaps you can go along. Handsomely matted, all shipping, handling and mat are included in costs. 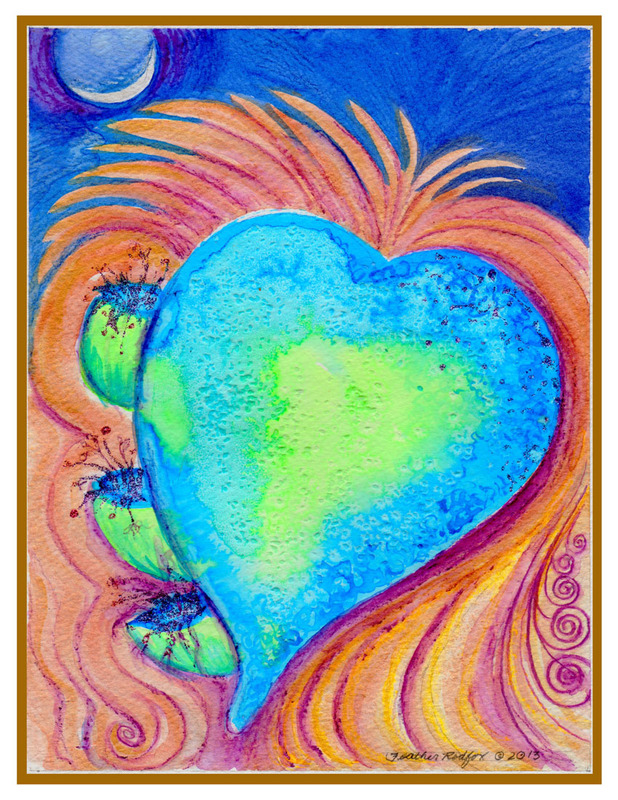 Resting under a new moon, this watercolor blue heart grows star plants on its side and shares its beautiful energy with you to enjoy. Handsomely matted, all shipping, and mat are included. 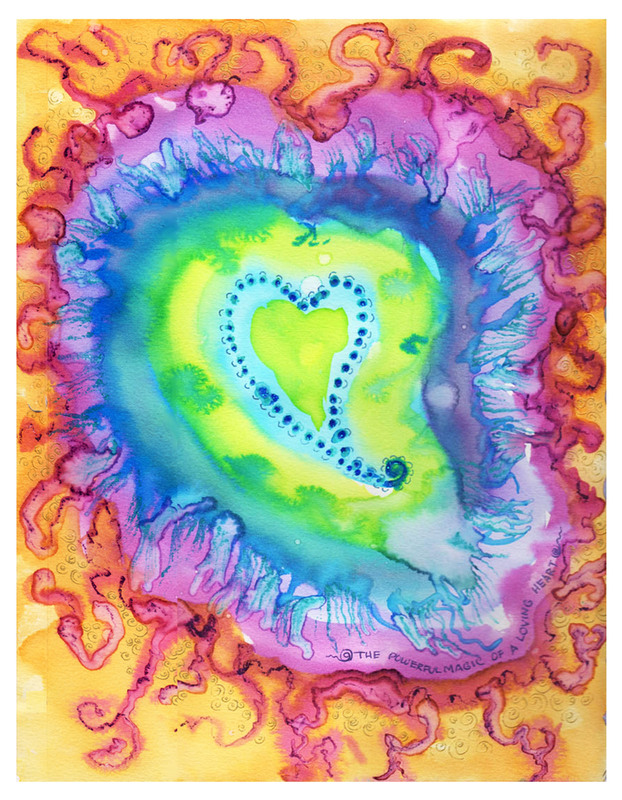 Playing with watercolor and colored pencil gave me great enjoyment as I created this heart full of gratitude. 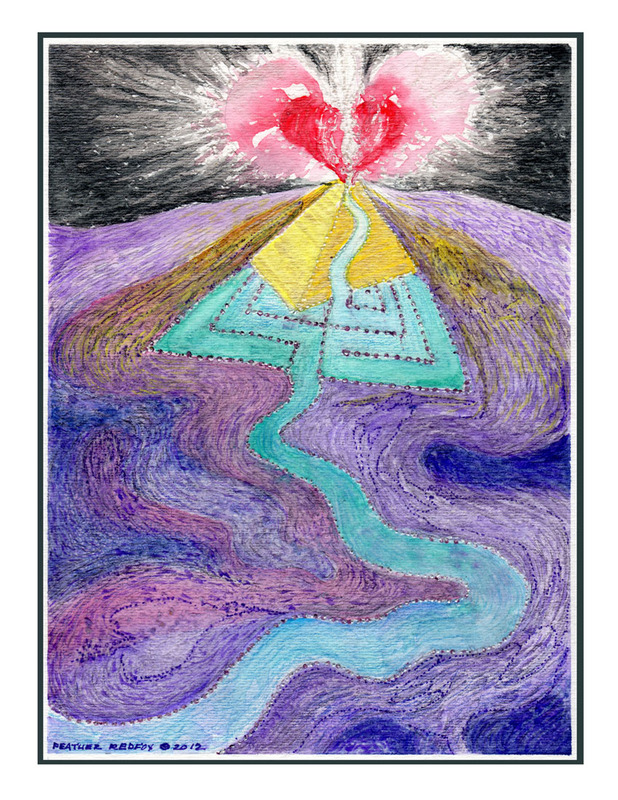 It's meant to remind us of the healing powers of a loving heart, beauty and light as they manifest in being grateful. 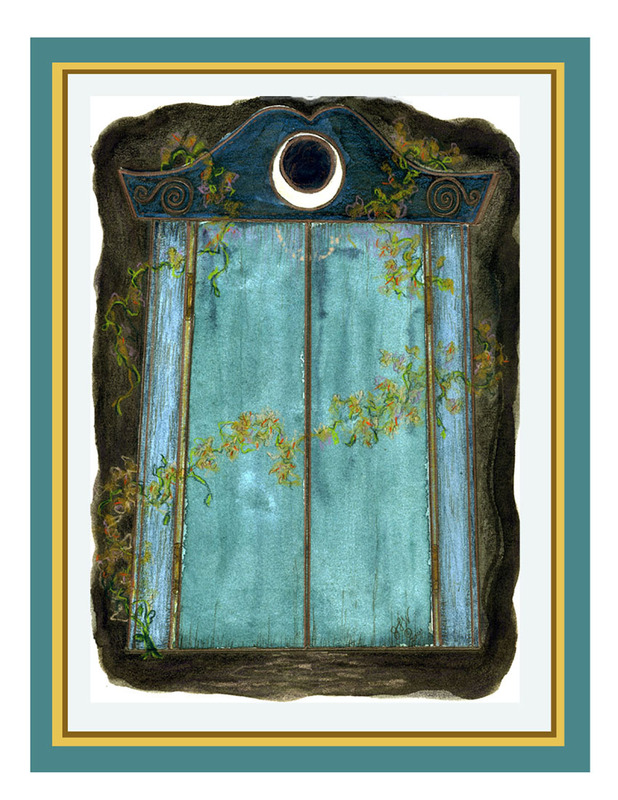 A new moon and a new doorway appears, a new beginning, and if we choose, opens to wondrous new possibilities. May you see the doorway and walk thru in joy and trust, to have many blessings rain upon you! Use this watercolor to connect to previously unseen portals of possibility. What are they? Where are they? Who will you be if you walk thru? Handsomely matted, all shipping, handling and mat are included in costs. Picture a beautiful,crystaline cave that opens to the Universe where you can just be, a sacred space with Goddess/Source energy to connect with for your guidance. There are four columns of glyphs there as well, perhaps recording the completion of iniations here. This is a Dreaming Space. 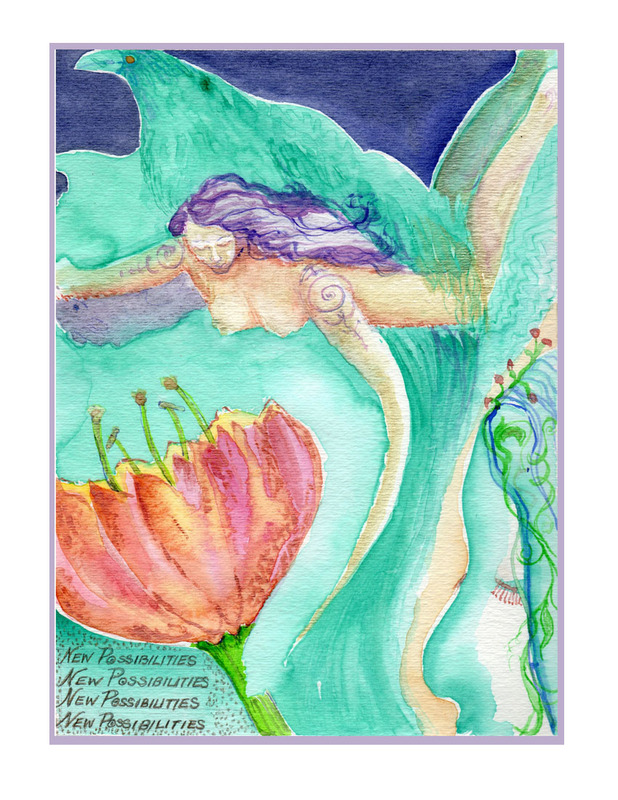 The beautifully matted watercolor print pictures one image given to me of a dreaming space to focus on as you connect to your inner guidance. Hold its quiet, sacred space in your knowing as you move thru your busy day. Shipping,handling and mat included in price. The Many are Dreaming together in the Heartspace of Source. 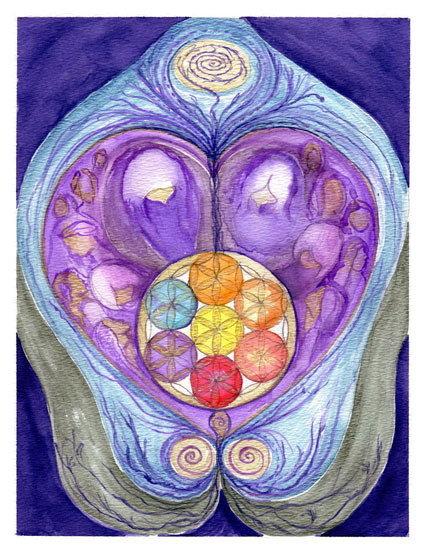 We are dreaming our connections of blood, DNA and more as we see in the Flower of Life figure held within our Goddess Mother's image. Together we envision, dream the new so that we may collaborate to create it! 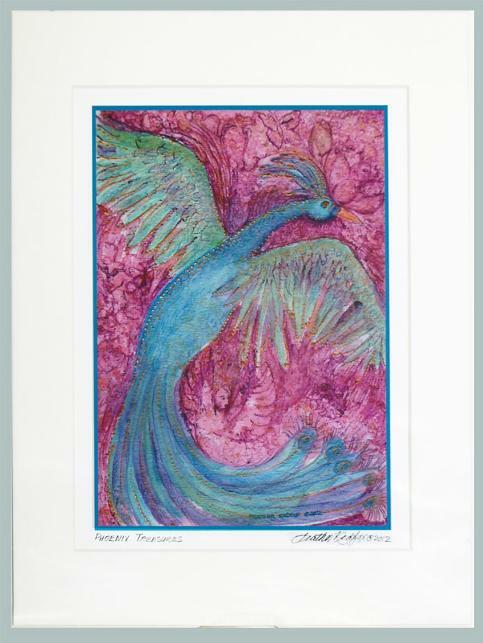 Handsomely matted watercolor print 11"x 14". Shipping, handling and mat included in cost. 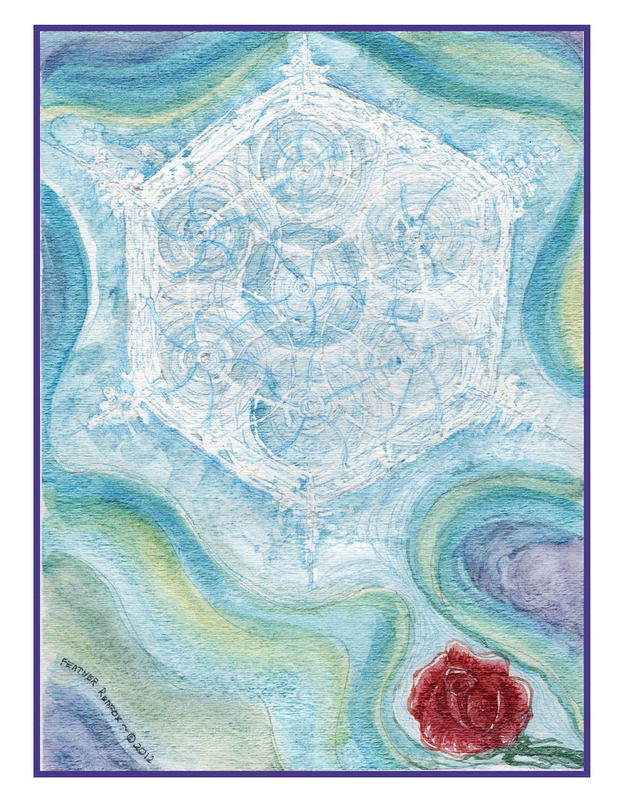 This Rose Mandala print is wonderful for dreaming or meditating, to bring calm, centered energy to you and your surroundings. Focus on the outside border moving slowly to the darker area of chaotic images then on to the still, cream rose in the center. 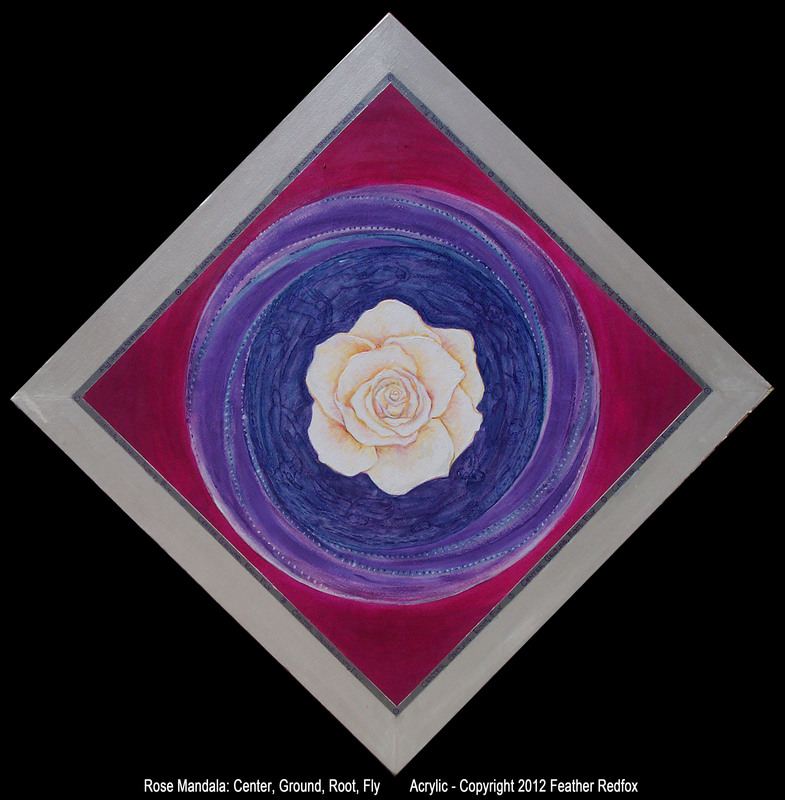 The Rose Mandala print has beautiful energy for a hectic office or workplace, or in your home, and can help to center you so that you may then ground, root and fly! The original is not available and has been sold. 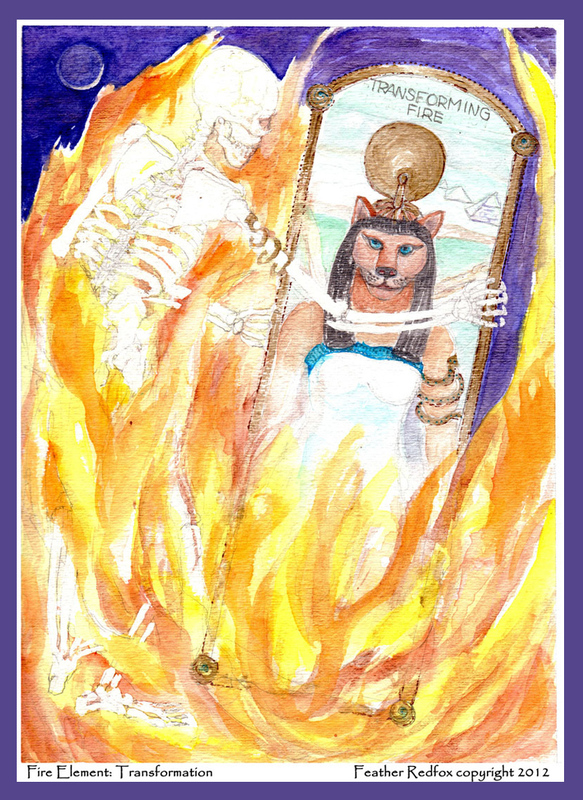 A small watercolor with touches of acrylic, this painting reflects the energetics of Fire as an elemental. Each element has its own special powers, its own special energetic feelings. Fire is an energy of transformation, clearing, changing, sometimes of hardening or changing to a more fluid form. It brings the opportunity for new birth like the Phoenix Bird, rising from the ashes. 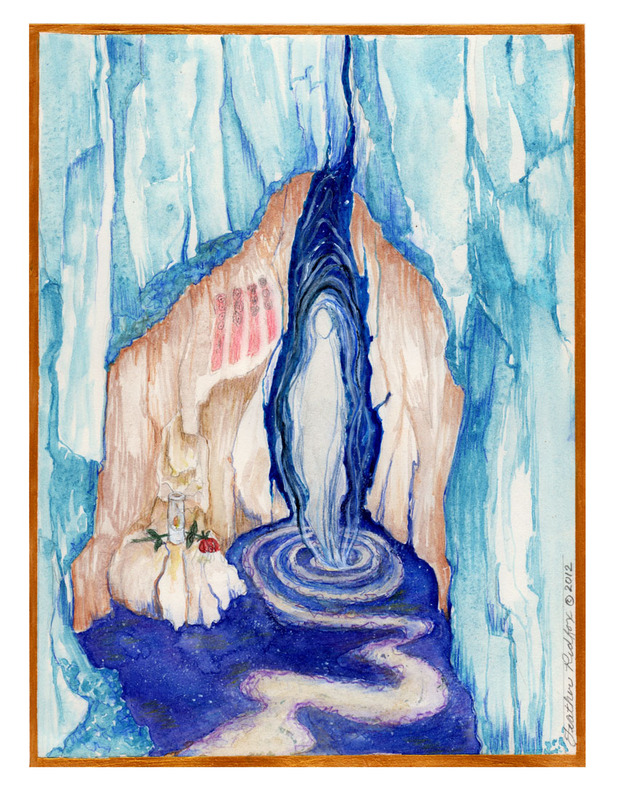 A small watercolor, this painting reflects the energetics of the Water as an elemental. Each element has its own special powers, its own special energetic feelings. Water is an energy that shows us how to shapeshift fluidly into different forms of ourselves and be persistent, finding ways thru the seemingly impossible dams in our lives to the Rose Path of Resolution. 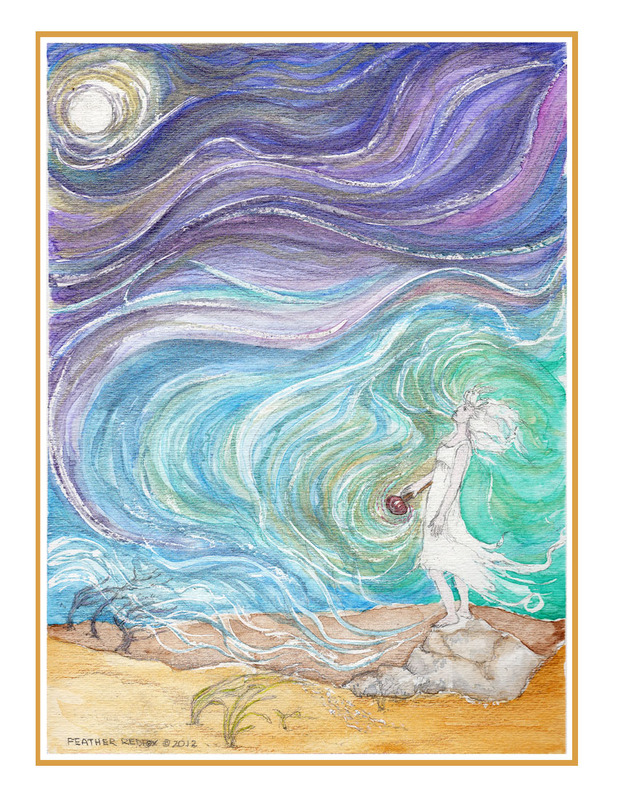 A small watercolor, this painting reflects the energetics of the Air as an elemental. Each element has its own special powers, its own special energetic feelings. The wind is an energy that surrounds us either gently or with force at all times as the Element of Air. It fills our dream sails and flys us to our destinations. Before making this painting, I went outside and used a rattle to call in the wind and experience it. The west wind came as one of my allies and blessed me with its energy. This little painting is the result of that experience. 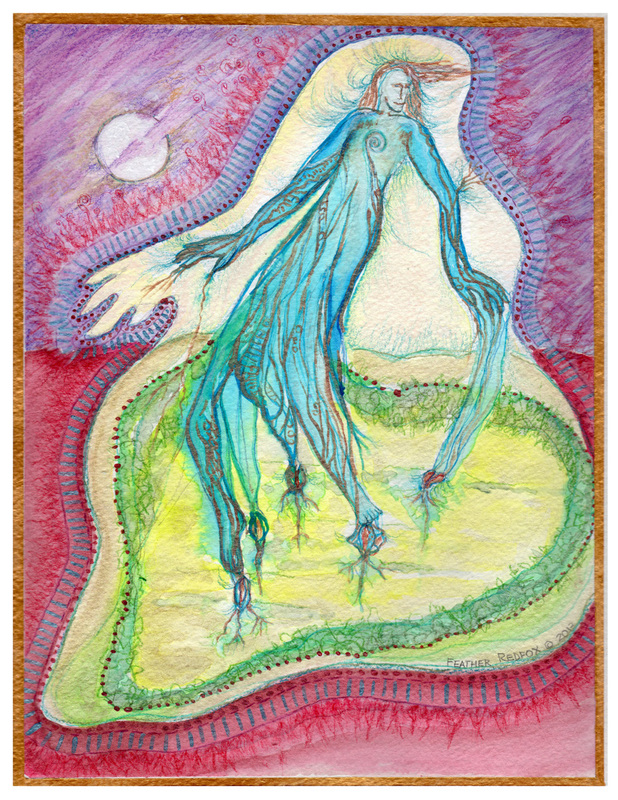 A small watercolor, this painting reflects the energetics of the Earth as an elemental. Each element has its own special powers, its own special energetic feelings. The earth is fecund, a place of beginnings of nurturance, a chalice for star seeds. Many seed beings hide in this piece. Can you see them? What Direction Is Your point of View? This painting of watercolor and colored pencil illustrates seeing concerns from different points of view both in the physical and the spiritual realm. It reminds us that we too often become rooted to one point of view and lose the possibility that other positions or points of view may offer to us. 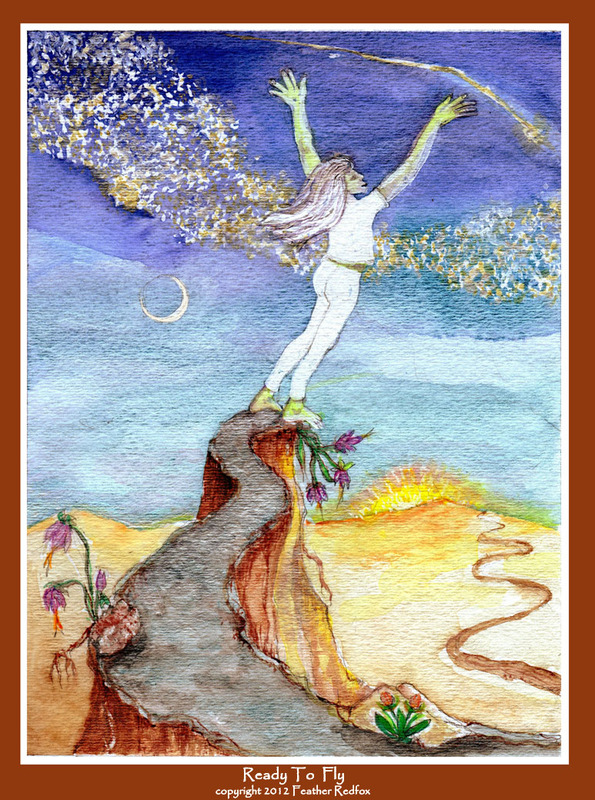 This watercolor painting reflects the energetics of taking a leap into the unknown, off a cliff so to speak, as we choose to follow our HeartPath...a leap of faith that will surely take us home to ourselves. So often we find ourselves struggling with a situation or concern. 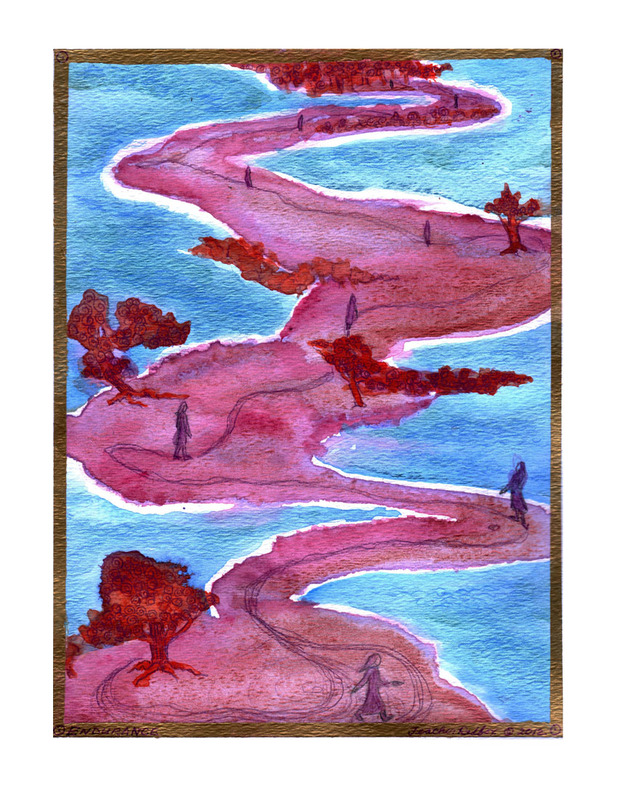 This watercolor image reminds us to have endurance and that even though the landscape may stay much the same, we are infact making progress, covering some distance in the work that we do. This painting of watercolor and colored pencil shows a number of images in both unusual colors and positions so that they may not be immediately visible to you, much like the possibilities of our lives. ( Do you see the little mouse?) There are many possibilities that we do not see at first. Our task is to learn to look and live beyond the possible! 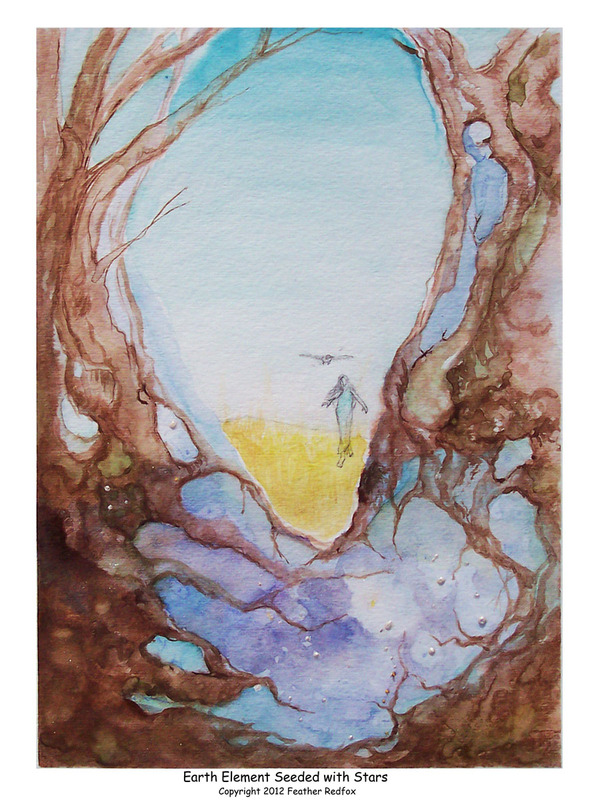 DREAM PAINTING - This watercolor and acrylic painting came from a dream I had of sitting in the woods at night and suddenly hearing something moving. I peered thru the trees only to see an animal running behind me. Hiding behind the tree where I had been sitting, I realized it was a wolf and that it was coming and would "Destroy" me. I saw its face clearly with dark fur and white central face area. It had blue eyes, and its teeth bared. I couldn't stop it. It was a shamanic or medicine dream and the wolf was a symbol of my need to give death to my resistance to getting a project done, rebirth my intent and actually doing that work. Perhaps it was also about pursuing even more strongly the ever deeper "doing" that I am here for. Later I was drawn to take down a deer mask and dust it off as well, realizing that it too was symbolic, representing my more hermit like self and my creativity. 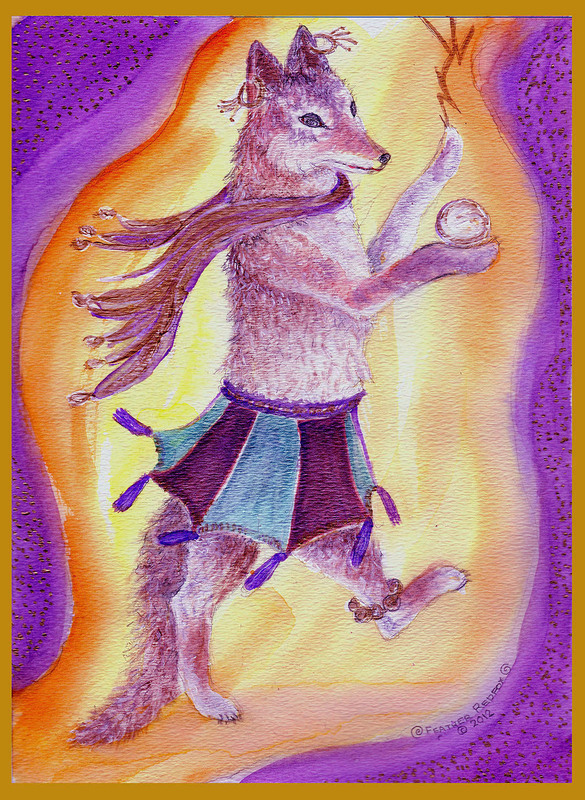 In the painting there are some wolf and deer tracks that are with me and I am wrapped in a blanket of the stars. In other work I was doing, Isis had told me to be open to the energies of the stars and the lights of the nighttime as energy helpers and guides for this next period of time. So I gathered all of this information together and created the little painting called StarStalking. 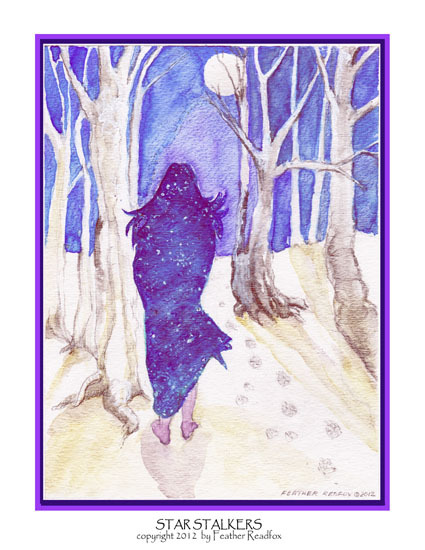 An original watercolor, this painting was created for the February Sojourn Studio card reading. Here is just a bit of that information: From ancient times, the Phoenix has been a bird of mystery who died in a fire, leaving only ashes that then resurrected themselves into to a newly born bird. 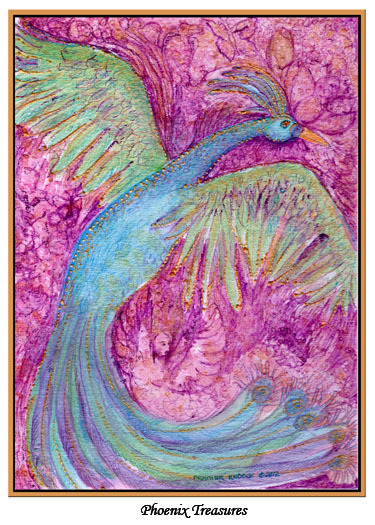 Death and transformation of aspects of our selves is the most obvious treasure that this phoenix symbolizes but there are others as well. "Surprise treasures are coming to you. Open your eyes so that you can see them for what they are as they may not be wrapped as you expected. Remember the phoenix is a fierce being and accepts no halfway measures (in receiving its gifts). So Dream and hatch your new self carefully, (from the transformation the phoenix is offering)." 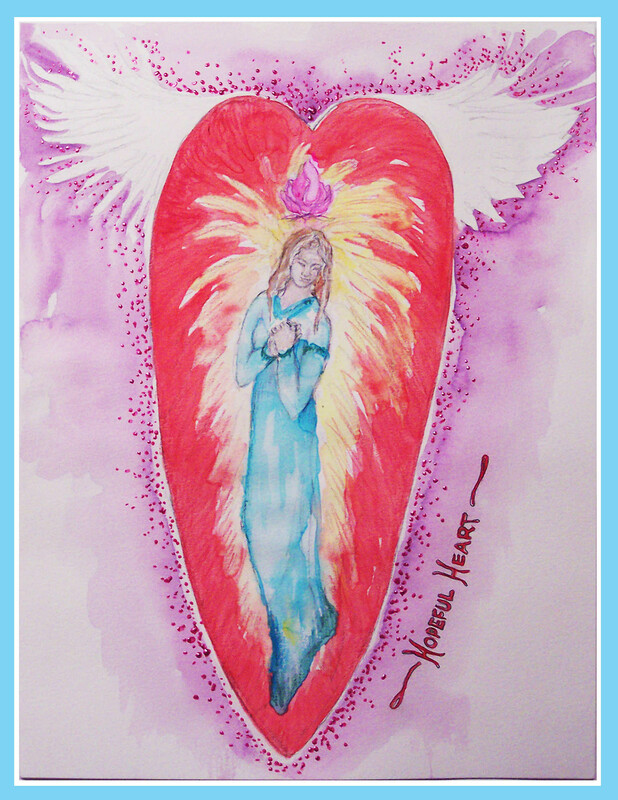 A simple original watercolor, this painting looks like a version of The Virgin of Guadelupe though I hadn't intended that at the time. It simply represents the hope in our hearts for those things that are important to us....sometimes, perhaps often, a hope that goes beyond rational thinking.